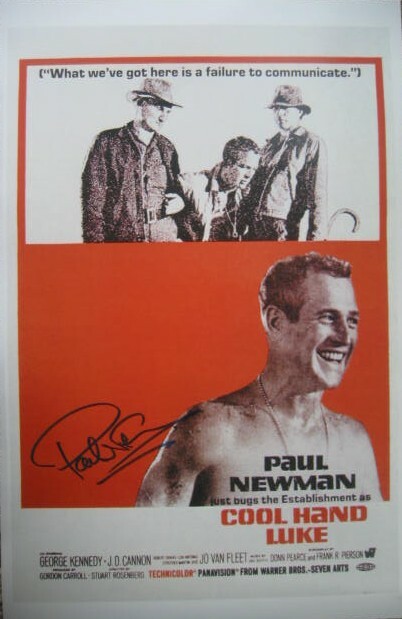 11 X 17 CLASSIC MOVIE POSTER FOR “COOL HAND LUKE” SIGNED BY THE ONE AND ONLY HOLLYWOOD LEGEND PAUL NEWMAN.SIGNED IN BLUE FELT TIP. ACCOMPANIED WITH A COA FROM TRISH HESSEY AUTOGRAPHS. THIS IS A VERY HARD TO FIND ITEM, COOL HAND LUKE AUTOGRAPHED POSTERS ARE NOT FOR SALE EVERYDAY.